We’re hurtling toward the holidays faster than a fat guy in a flying sled, so you’ve got to take some time to enjoy L.A. before the onslaught of airport layovers and family dinners commences. Here’s some of the best stuff to do in L.A. this weekend, from rooftop movie screenings to Stevie Wonder’s annual charity event. There are the luminarias that line your driveway, and then there are the gargantuan lanterns on display at the Los Angeles County Arboretum. Artists from China’s Sichuan province teamed with the Arcadia institution on a mile-long museum of massive silk creations, from twinkling dragons and pandas to radiant flowers. Book a timed ticket for the late afternoon, then grab dinner and drinks from the food trucks and bars on-site. Getting a picture with Santa is cool and all, but everyone knows Rudolph is the real celebrity. A whole herd of reindeer (including precious new baby Nutmeg, pictured above) takes up temporary lodging in the L.A. Zoo’s Reindeer Village, where photo ops abound. While you’re there, scope out the sparkling Zoo Lights displays, also on view through January 6. Hop on the Red or Purple Line and get off at the Civic Center/Grand Park station, where a 12-acre art and projection display awaits. 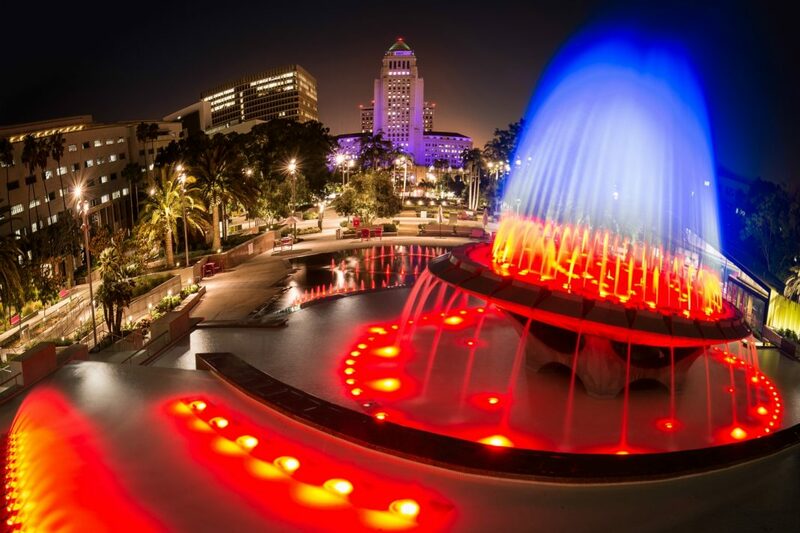 You’ll see DTLA’s park of record awash in light installations, from its iconic fountain to its winding pathways. You’ve still got a few days to catch some stellar films at this independent fest hosted at Cinemark 18. Take our word for it and grab tickets to Saturday’s 10 a.m. screening of Blissful at Zero, a heart-rending documentary about 33-year-old Angeleno Nicole Tupper and the terminal cancer diagnosis that can’t get her down. Stevie Wonder’s annual charity event returns to Staples Center for a night of cheer. As usual, the legend will be joined onstage by an all-star lineup—last year it was Tony Bennett and Pharrell—and asks that concertgoers bring an unwrapped gift for children and families in need. The oceanside town’s annual fireworks spectacular returns for a 29th year. The main event starts at 7 p.m., but show up at 4 p.m. for a snow park, live music, and a Santa float. Pro tip: Park near Marine Avenue and mosey the Strand to avoid congestion downtown.